Burano Italy is one of the most colourful places in the world. If you are visiting Venice Italy, it can be nice to swap the busy centre of Venice for the distinctive and tranquil Burano Island for a day. It will be an intriguing encounter on your Italian vacation. Burano Island Italy is situated in the north of the Venetian lagoon. It’s a short boat ride from Venice and you can get there on the Vaporetto/waterbus, but as many locals will tell you, it’s probably best, and better value, to take one of the guided boat tours that leave directly from Venice. At Avventure Bellissime, the Italian tours and Italian vacations specialist, we run a private excursion to Murano and Burano islands with a local expert guide aboard a luxury launch. We’d love for you to join us. Regardless of how you travel, Burano is a truly memorable place to visit. The island is full of very brightly coloured fishermen’s houses; the unusual sight is enhanced by the way these colourful buildings are reflected in the beautiful green lagoon that surrounds the island. 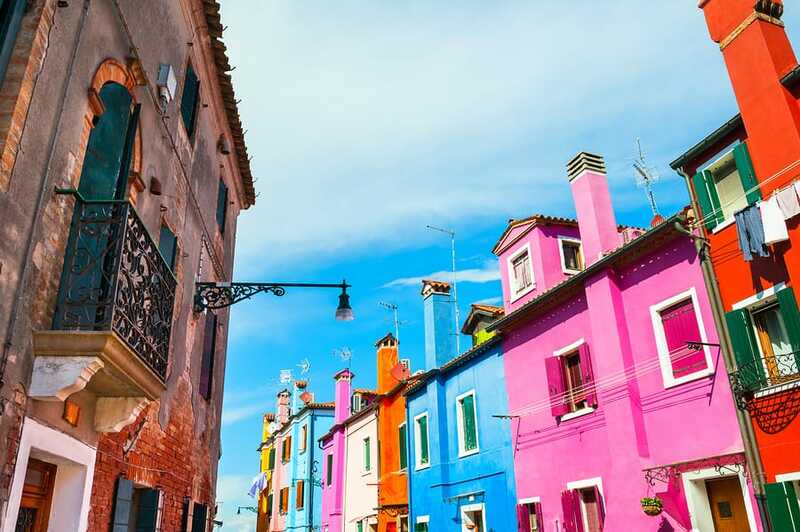 It is traditional to paint the houses of Burano in bright colours and it’s a tradition that still stands today but the original reason for doing so was a practical one. It is said that it helped local fishermen detect their house from miles away, as they arrived back from a fishing trip. The most colourful house on all Burano is la casa di Bepi Suà. It is painted in bright colours but with an eye-catching pattern of geometrical shapes. Bepi is no longer here, but his house has been restored and preserved and has taken the title of being the most colourful on the island. Given the competition, this is quite an achievement. Burano’s rhythm of life is dictated by the coming and going of the tides and the opportunities this brings the local fisherman. It’s a tranquil and relaxing location in the Venetian Lagoon. As well as fishing and tourism, Burano is also famous for lace making. It is an art that’s been handed down for many generations. As far as we know there is no exact date of origin. Although there are a few legends that try to explain how the tradition began. One of these is that a young sailor brought some beautiful seaweed back from a far away land for his bride to be. She loved the intricate pattern of the seaweed so much that she copied it with her needle and thread. And so the tradition of Burano lace was borne. Today you may still see someone creating lace work on the island of Burano. You can buy Burano lace at the shops on the island – many sell wedding dresses to children’s clothing. You can also see some beautiful lace work examples in the Burano Lace Museum on the island. 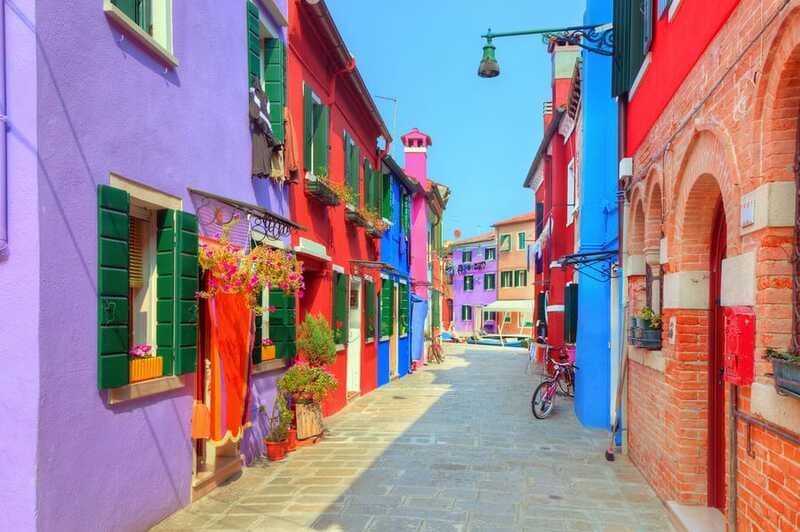 We’d be delighted to help you explore the island of Burano during your Italian holiday. And if you are planning your Italian vacation, we would love to help. At Avventure Bellissime – we are Italian tours and Italian holidays expert. We can help you have the best possible experience of Italy – whether it’s on our tour of Burano or on one of our tours of Italy’s many sights or an Italian vacation package. Visit us at tours-italy.com for more information.